This very interesting disc on Warner's Maestro label pairs two identically scored but extremely intriguing works. Mozart's Quintet K. 452 dates from 1784, one of the composer's most fruitful years. Although he was certainly not new to chamber works, he had never attempted a piece for such a combination of instruments, so to a certain extent he was breaking new ground. The work is in three movements and its many arresting tunes and virtuosic moments are a manifestation of Mozart's inexhaustible genius. Although Beethoven's friendship with the Salzburg prodigy was questionable, his admiration was undoubtedly on the level of almost total adulation. Hence the Quintet Op. 16 of 1796 has the same tonality, instrumental choice and number of movements. It is a heartfelt homage to his eminent predecessor but while the former is operatic in content, the latter foreshadows the great symphonic masterpieces that were to change music forever. 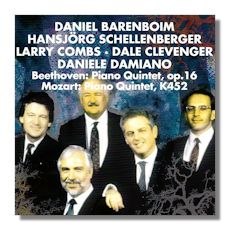 All five soloists perform with a peerless energy and miraculous unison that delights throughout and although playing time is on the lean side, this issue has a charismatic aura which is all of its own.